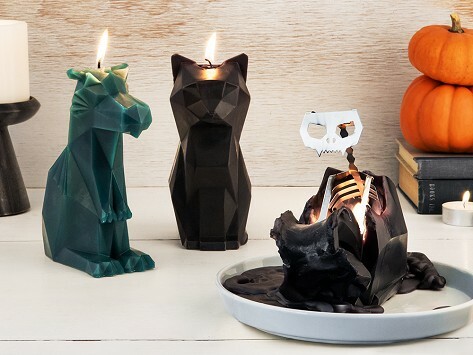 This animal skeleton candle turns an otherwise modern-looking piece of decor into something a little bit wicked. Inside each creature hides a metal skeleton that is revealed when the wax melts. Unexpected and impossible to ignore. Dimensions: Cat: 6.7" x 2.9" x 4.5"; Unicorn: 5.1" x 2.6" x 8"; Dragon: 7" x 2.6" x 6"; Reindeer: 5.1" x 8.7" x 3.9"; Owl: 4" x 4" x 4.3"
Weight: Cat: 1.2 lbs. ; Unicorn: 1 lb. ; Dragon: 0.85 lb. ; Reindeer: 1 lb. ; Owl: 0.63 lb. Daughter in law loves Halloween throughout the year, so this was a fun surprise for her. I gave this to my son's girlfriend for Christmas. They both like cats and somewhat spooky things. She loves it. So cool - I had to buy more! We love anything dragon and this candel is so cute. Don't know when we will burn it, I like to look at it. Artist Thorunn Arnadottir’s animal skeleton candles perfectly capture her sense of humor, which she describes as “a bit wicked”. Her PyroPet collection balances precariously on the line between cute and twisted; as a candle burns, the animal melts away to reveal an unexpected surprise. Spoiler: It’s a metal skeleton. While studying at the Royal College of Arts in London, Iceland-based Thorunn began toying with the idea of what a shaped candle looks like once it melts. She thought the results were often creepy. Playing off that, Thorunn first made a cat candle—complete with its own skeleton—and has expanded the PyroPet menagerie to include an owl, a reindeer, and other charming creatures. Lighting one of her candles is an experience you want to watch unfold—it’s unexpected, a little dark, and impossible to ignore, which suits Thorunn perfectly.